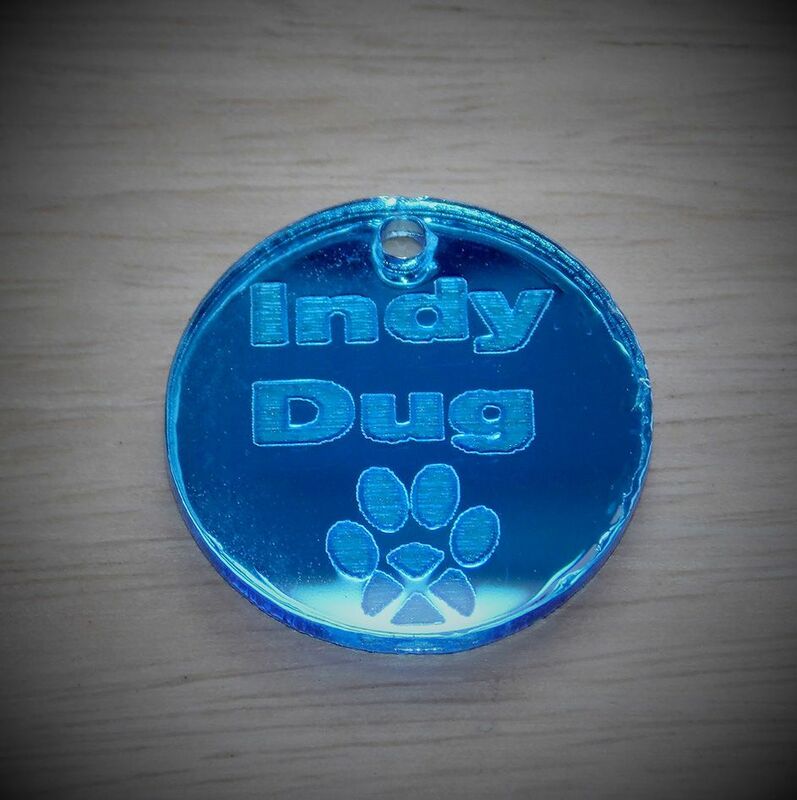 Here we have a pretty blue tartan flower with hints of gold lurex, in the centre sits a laser cut acrylic heart engraved with our signature Saltire heart design and finished with a glitter lacquer.This is set on a 38 mm brooch pin finding and is approximately 60 mm in diameter.Great for starting Yes conversations, wearing to Indy Marches & as a gift for a Yesser.Price includes 1st class mainland shipping. Here we have a pretty blue tartan flower with hints of gold lurex, in the centre sits a laser cut disk with a Celtic heart design engraved with Yes & finished with a glitter lacquer.This is set on a 38 mm brooch pin finding and is approximately 60 mm in diameter.Great for starting Yes conversations, wearing to Indy Marches & as a gift for a Yesser.Price includes 1st class mainland shipping. 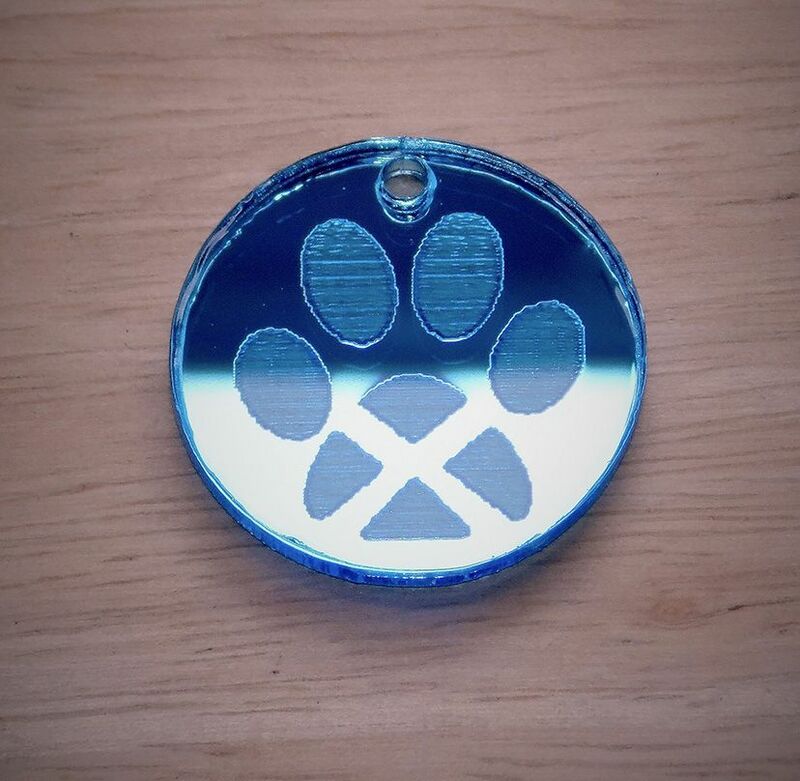 Here we have a pretty blue tartan flower with hints of gold lurex, in the centre sits a laser cut disk with our signature Saltire Heart and positive 'Yes We Can Scotland' slogan, Also comes finished with a glitter lacquer.This is set on a 38 mm brooch pin finding and is approximately 60 mm in diameter.Great for starting Yes conversations, wearing to Indy Marches & as a gift for a Yesser.Price includes 1st class mainland shipping. Here we have a set of 2 mini tartan flowers on 4.5 cm black hair grips, each has an engraved acrylic centre design as pictured and are very cute indeed.Flowers measure approximately 4 cm. Here we have a set of 3 mini tartan flowers on 4.5 cm black hair grips, each has an engraved acrylic centre design/gem stone as pictured and are very cute indeed.Flowers measure approximately 3-4 cm. 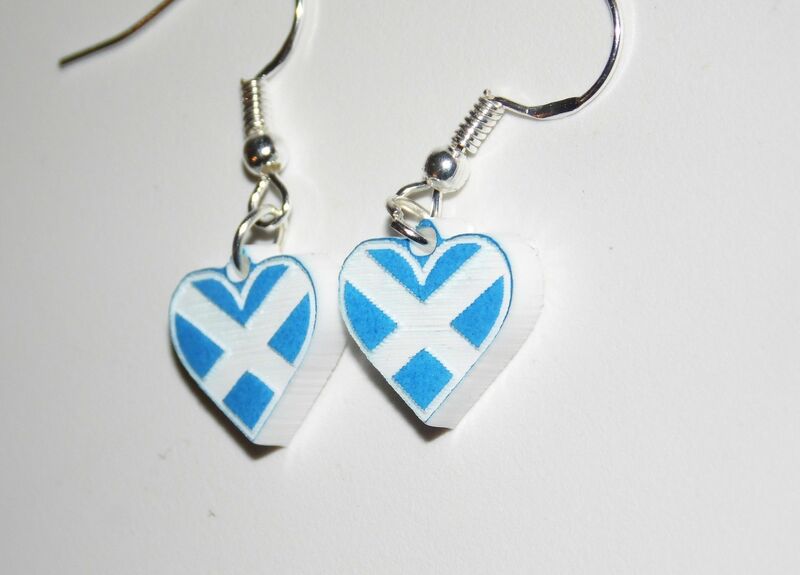 Here we have engraved & laser cut earrings in our signature blue saltire heart design.Approximately 15 mm in diameter on sterling silver findings.Great for wearing to marches & they make the perfect gifts for Indy friends.Price includes 1st class mainland shipping. Here we have a pretty blue tartan flower with hints of gold lurex, in the centre sits a laser cut disk with our signature Saltire Heart and positive 'Yes We Can Scotland' slogan surrounded by faux blue gems, Also comes finished with a glitter lacquer.This is set on a 38 mm brooch pin finding and is approximately 60 mm in diameter.Great for starting Yes conversations, wearing to Indy Marches & as a gift for a Yesser.Price includes 1st class mainland shipping. Here we have a pretty blue tartan flower with hints of gold lurex, in the centre sits a laser cut disk engraved with our national flower, the Thistle & surrounded by faux blue gems, Also comes finished with a glitter lacquer.This is set on a 38 mm brooch pin finding and is approximately 60 mm in diameter.Great for starting Yes conversations, wearing to Indy Marches & as a gift for a Yesser.Price includes 1st class mainland shipping. Here we have a pretty blue tartan flower with hints of gold lurex, in the centre sits a laser cut disk engraved with our national animal, The Unicorn & surrounded by faux pearls, Also comes finished with a glitter lacquer.This is set on a 38 mm brooch pin finding and is approximately 60 mm in diameter.Great for starting Yes conversations, wearing to Indy Marches & as a gift for a Yesser.Price includes 1st class mainland shipping. Here we have a set of 4 mini tartan flowers on 4.5 cm black hair grips, each has an engraved acrylic centre design/gem stone as pictured and are very cute indeed.Flowers measure approximately 3-4 cm. Here we have a pretty blue tartan flower with hints of gold lurex, in the centre a round laser cut acrylic disk engraved Yes We Can/Saltire heart design and surrounded by faux pearls.This is set on a double hair clip/brooch pin finding as pictured and is approximately 60 mm in diameter.Great for starting Yes conversations, wearing to Indy Marches & as a gift for a Yesser.Price includes 1st class mainland shipping. 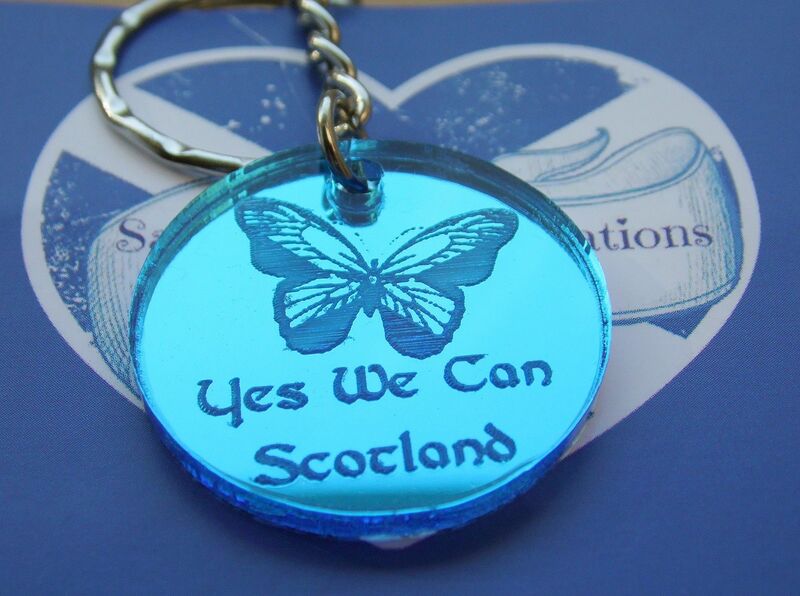 Here we have a pretty blue tartan flower with hints of gold lurex, in the centre sits a laser cut acrylic heart engraved with our signature Saltire heart design.This is set on a double hair clip/brooch pin finding as pictured and is approximately 60 mm in diameter.Great for starting Yes conversations, wearing to Indy Marches & as a gift for a Yesser.Price includes 1st class mainland shipping. Here we have a pretty layered purple tartan flower with hints of gold lurex, in the centre a laser cut engraved gold Celtic knot, finished with gold glitter.This is set on a double hair clip/brooch pin finding as pictured and is approximately 80 mm in diameter.Great for starting Yes conversations, wearing to Indy Marches & as a gift for a Yesser.Price includes 1st class mainland shipping.